A new higher education programme, “Leadership for Inclusion in the Early Years” (LINC), commenced in September 2016. The Department of Children and Youth Affairs will fund up to 900 places per annum on this programme. Graduates from the programme will be able to take on a new leadership role of Inclusion Co-ordinator within their pre-school setting which will attract an increase of €2 per child per week in the rate of ECCE capitation payable to that setting. Service providers and parents or guardians will be able to submit applications for AIM supports from June 2016 to allow them to plan ahead for pre-school enrolment in September 2016 and thereafter. It should be noted that applications will remain open throughout the year although, in the case of children with more complex disabilities, parents and providers are encouraged to apply early. Advice and support from the Early Years Specialist Service (Access and Inclusion) can be accessed by phone (01 511 7222), e-mail (onlinesupport@pobal.ie) or via the AIM online application form at www.pobal.ie. This form only needs to be completed once to access supports across levels 4, 5, 6 or 7. To apply for specialised equipment, appliances or a grant towards minor alterations, service providers, in partnership with parents or guardians, should complete the relevant part of the aforementioned online application form on PIP. To apply for therapy services or additional capitation to fund extra support in the classroom, service providers, in partnership with parents or guardians, should complete the online application form on PIP, including the Access and Inclusion Profile section of the form. 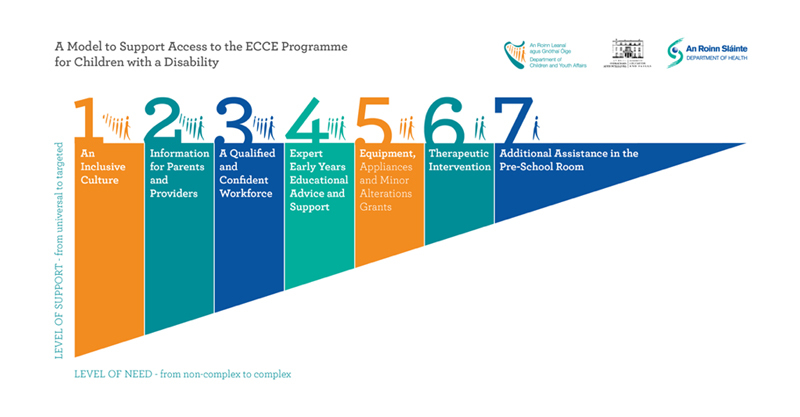 It is estimated that only 1 to 1.5% of children in ECCE will require, and therefore be eligible for, the Level 7 additional capitation. Finally, while the Access and Inclusion Model is being introduced from June 2016, full implementation will take time as capacity is built across the sector. For more detailed information on AIM, please refer to these dedicated webpages For Parents, For Service Providers, Frequently Asked Questions and Key Documents webpage.